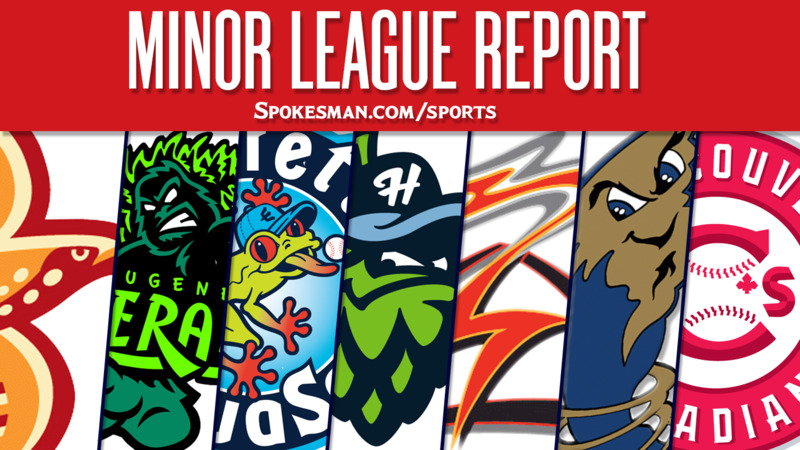 Eugene 9, Spokane 4: Tyler Durna hit a two-run home run as part of a five-run 11th inning and the visiting Emeralds (10-17) beat the Indians (9-18). Starter Tai Tiedemann was roughed up for three runs on four hits and four walks over 3 2/3 innings. Vancouver 7, Boise 1: Otto Lopez went 3 for 5 with a solo home run and three RBIs and the visiting Canadians (14-13) topped the Hawks (15-12). Griffin Conine went 3 for 5 and scored twice for Vancouver. Hillsboro 9, Tri-City 5: Ryan Dobson went 2 for 5 with three RBIs and the Hops (19-8) handled the visiting Dust Devils (13-14). Francis Martinez and Joey Rose added a solo homers and Tre Holmes scored three times for Hillsboro. Salem-Keizer 3, Everett 1: Joey Bart, the No. 2 overall pick in the 2018 MLB Draft by San Francisco, hit his sixth home run in his first seven NWL games, and the visiting Volcanoes (15-12) got past the AquaSox (13-14). Round Rock (AAA) 8, Oklahoma City 4: Hanser Alberto went 3 for 4 with a three-run home run and four RBIs and the Express (44-46) beat the visiting Dodgers (46-40). Willie Calhoun went 2 for 4 with an RBI for Round Rock. San Antonio at Frisco (AA): Postponed due to rain. Buies Creek 2, Down East (High-A) 0: Brandon Bailey struck out six over five innings and the Astros (52-39) shut out the visiting Wood Ducks (44-48). Emerson Martinez was the hard-luck loser, allowing two unearned runs on three hits and a walk with six strikeouts over six innings. West Virginia 8, Hickory (Low-A) 2: Fabricio Macias drove in three and the visiting Power (48-38) handled the Crawdads (40-48). Tyreque Reed went 2 for 4 for Hickory.